MANSFIELD, Mass. – Mansfield won its third straight league title this fall, and its first outright championship in program history, so the Hornets are no stranger to regular season success. But, in the state tournament, Mansfield has been knocked out in the first round each of the past two seasons. This group of seniors (of which there are 19 on this year’s roster) had not seen the second round since they were freshman year and they were hungry to add a playoff run to their league accomplishments. That hunger was intensified by Saturday evening’s opponent in the Div. 1 South opener at Alumni Field, as King Philip upset the Hornets in overtime two seasons ago. 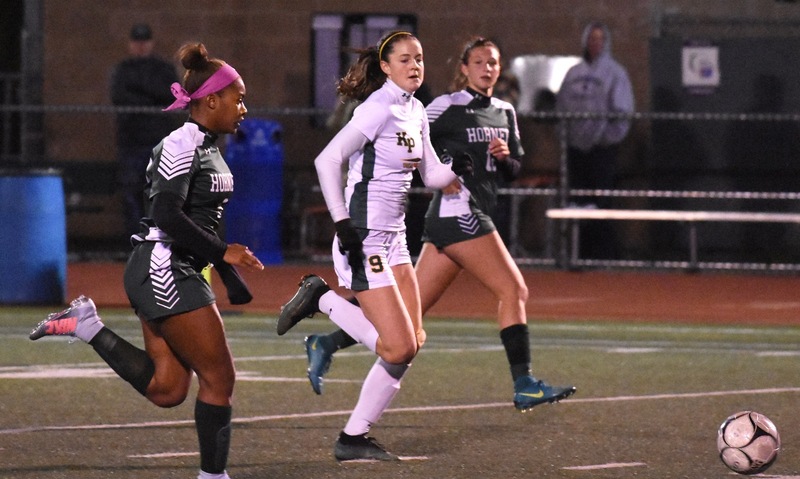 The Hornets scored twice against the wind in the first half (and arguably against the run of play) and held on with a typically stout defensive performance to shutout the Warriors 2-0 and advance to the South quarterfinal. King Philip (12-5-2) opened the game with the wind at its back and the Warriors used it to put the hosts on their heels early on. Inside the opening 10 minutes, Abby Baker had the first chance of the game for KP. A throw in from the left side went off the shoulder of Mansfield defender Mikaela Maughn and Baker forced keeper Lauren Whitman into the first of her six saves. Just two minutes later, Avery Snead threaded a pass to Ally Stanton, who laid it into the path of Chloe Layne but the shot lacked power and Whitman saved. Despite the pressure from the Warriors over the opening half hour, it was Mansfield that got the game’s first goal with its first shot on target. Kemp battled KP defender Olivia Berry on the right side of the box and managed to squeeze it loose into the middle where Cassidy McMahon ran onto it and was able to side-foot it past keeper Taylor Butler. The Warriors came right back with a series of chances. Snead rose highest to head a long free kick from Makayla Griffin but Whitman was there for the save, then right back Lauren Anderson fired a long pass up top to Layne, who flicked it into the path of Jenna Hitchen on the left side but again it was saved. In the 37th minute, KP’s forwards combined again – Stanton to Snead to Layne, but the junior’s finish was just wide. Two minutes later and the lead was doubled. A throw in from the left side was flicked by Sydney Mulkern to Melissa Reef at the corner of the box. The senior midfielder spun past her marker and onto her right foot before curling an unstoppable shot into the top corner for a 2-0 advantage. Mansfield got the wind in the second half and it almost paid immediate dividends when Bryn Anderson got to the end line and cut it back for Kemp, who blazed over the bar. Even into the wind, the Warriors looked dangerous in attack. Baker touched one on to Layne, who fired over and then she had a second chance with a half-volley from a Faye Veilleux throw in but couldn’t get enough power on it to beat Mansfield’s second half keeper, Caty DeMassi. Hitchen set up Snead in the middle but she also sent her shot over the bar. In the 62nd minute, Anderson drove forward from midfield but her shot from the edge of the box was inches over the crossbar. In the final 20 minutes, Mansfield locked down on the defensive side. Maughn and fellow center back Emily Vigeant were keeping a constant eye on Snead in the middle of the field, while freshman Katie Miller was tasked with following Layne as closely as possible. Reef added to the defensive shape from midfield and outside backs Mulkern and Kerina Geminiani were always on the cover. 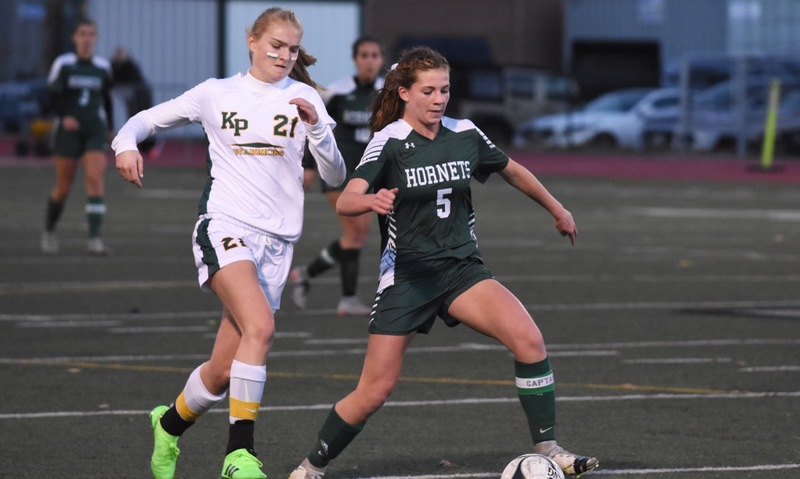 The Hornets allowed a league-low eight goals this season and that defensive strength was evident as they closed out the game and protected a two-goal cushion. At the final whistle, the whole team raced to the far end of the field to celebrate the win. Mansfield (14-2-4) will travel to face No. 4 seed Bridgewater-Raynham on Monday in the sectional quarterfinal. MANSFIELD, Mass. – Last season, King Philip and Mansfield shared the Kelley-Rex division trophy. Earlier this year it looked like both teams were in line to repeat before the two teams met for the first time. The Hornets won that game 4-1 and are now on the verge of a third straight title, while KP went into a tailspin, losing four straight. On Monday night at Alumni Field, the two teams met again. Behind a pair of goals from Avery Snead, the Warriors beat Mansfield 2-1 to force the Hornets to wait a few days before clinching the title and to regain some of their confidence with the state tournament looming. KP has been trying out a number of different lineups and formations in the last couple of weeks to try and find a set up that would work best. On Monday, Pichel pushed Snead up top as the lone forward and moved Chloe Layne into a central midfield role to give her more touches and allow her to create. The formation shift nearly worked right from the opening whistle, as Layne squeezed between a couple of Mansfield defenders and created space on the left side of the box. Her cross flashed across the goal and was knocked out. On the ensuing corner, Faye Veilleux’s header from a few yards out went narrowly wide. While it was a good start for the Warriors, Mansfield started to bypass the middle of the field and use its speed on the wings. The Hornets hit long diagonal passes in behind the KP fullbacks and were able to create a number of chances. Katie Garvin slid a pass through to Sydney Mulkern down the right channel in the eighth minute and the winger was able to pick out Steph Kemp alone in front. KP goalie Taylor Butler (six saves) needed to be out quickly to smother the shot. It was a sign of things to come in the first half. A cross from the right side by Erin Daniel found Melissa Reef in space on the far side of the box, but she was unable to keep her header down. In the 21st minute, Kemp dropped in to pick up the ball and she slipped Cassidy McMahon in behind the defense only for the junior winger’s shot to come back off the far post. McMahon was causing havoc on the right side. She cut back onto her left foot and forced a diving save from Butler and she also set up freshman Katie Miller for a chance from 20 yards that went over. The Hornets profligacy in front of goal, gave KP the chance to grab the lead against the run of play. A long ball forward bounced around and Abby Baker was able to head the ball between a pair of Hornets defenders. Snead chased after it and was able to use her long reach to just get a touch on the ball in front of Kerina Geminiani and with Mansfield goalie Lauren Whitman stranded. The lead was very short-lived. Only a minute later and the Hornets were right back in it. Again it was McMahon that created the chance, cutting in from the right. She picked out Kemp in the middle, a good turn to free her right foot and the senior found an angle to slide her shot past Butler to make it 1-1. In the second half, the Warriors were more cognizant of the diagonal pass attacking the fullbacks to try and slow down the Hornets attack. Mansfield still had chances to take the lead, including a cross from McMahon on the left that nearly got to Mulkern on the back post if not for an intervention by Paige Varvarigos. A throw-in from Daniel then found Kemp in space and she hit a low cross to McMahon, who had made a long run unmarked down the left, but her shot went over the bar. KP started to come into the game after that chance and create scoring opportunities of its own. Snead picked the right pass to find Ally Stanton in space, but her shot was saved by Mansfield keeper Caty DeMassi. In the 63rd minute, the Warriors were back out in front. Layne got free on the left side of the box, in a rare foray forward, and she hit a cross/shot that went through the six-yard-box and nearly snuck inside the far post. The ball caromed off the post and straight to the foot of Snead, who made no mistake with the empty net. McMahon had another chance racing in at the far post, but her shot went over the bar, and Emily Vigeant’s corner with three minutes to play found the head of Reef but Butler was able to save comfortably. With Snead moved back to the center of defense alongside Makayla Griffin and Olivia Berry, the Warriors packed it in and largely held Mansfield at bay for the closing stretch of the game. KP nearly put the game away on the break when Jaida Caruso freed Jenna Hitchen for a run at goal, but the shot went over. 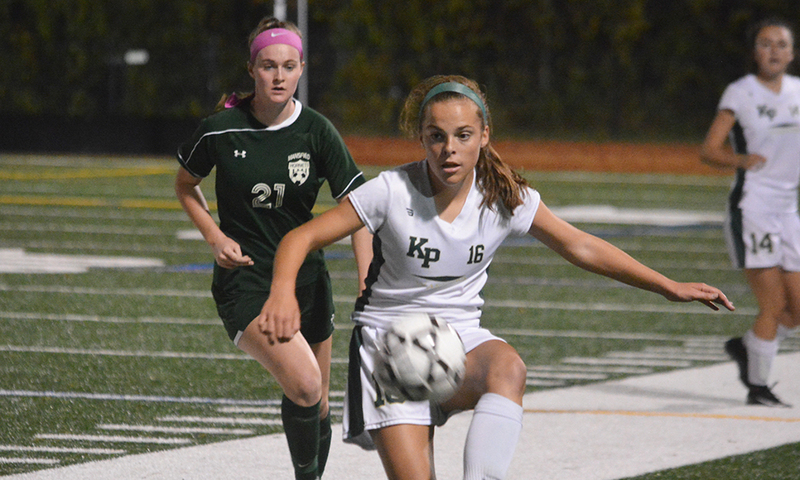 King Philip (10-4-2, 10-4-1) will try to keep the momentum going on Thursday at Oliver Ames. Mansfield (11-2-3, 10-2-2) can move closer to clinching the league title when it visits Stoughton on Wednesday. WRENTHAM, Mass. – Not all scoreless draws are the same. The lack of a goal does not automatically mean that a game was stale or defensive or boring. It goes without saying that not many scoreless draws have enough incidents to fill a page in a notebook either. Tuesday night’s rematch between Kelley-Rex division co-leaders King Philip and Mansfield at Macktaz Field was the latter. It was a game packed to the brim with excitement. The teams combined to hit the post three times, the goalies combined for 11 saves, two chances were blocked on the line, and the chances did not end until the final seconds of regulation. It was a game that had just about everything, except for a goal and a winner. King Philip and Mansfield lived up to the billing regardless of the 0-0 final score and it leaves the teams in a first place tie heading into the final game of the regular season, which means win the finale and win a championship. The blustery conditions provided an additional element of drama to the game, as the wind swept across the pitch towards the school and played havoc with clearances, goalkeeper punts, and free kicks. Even shorter passes were affected by the wind whipping from end zone to end zone. KP took the wind at its back to start the game and it helped the Warriors put the Hornets on their heels for the majority of the first half. It started just four minutes in when Jenna Midura chased down a long ball over the top and blocked the clearance by Mansfield keeper Lauren Whitman only to have the carom go just wide. Sophomore attackers Chloe Layne and Avery Snead got into the game shortly after, with Layne able to drag a Snead pass past a defender to get off a shot on the edge of the box and then controlled another Snead through ball to get a low shot that drew a save from Whitman. 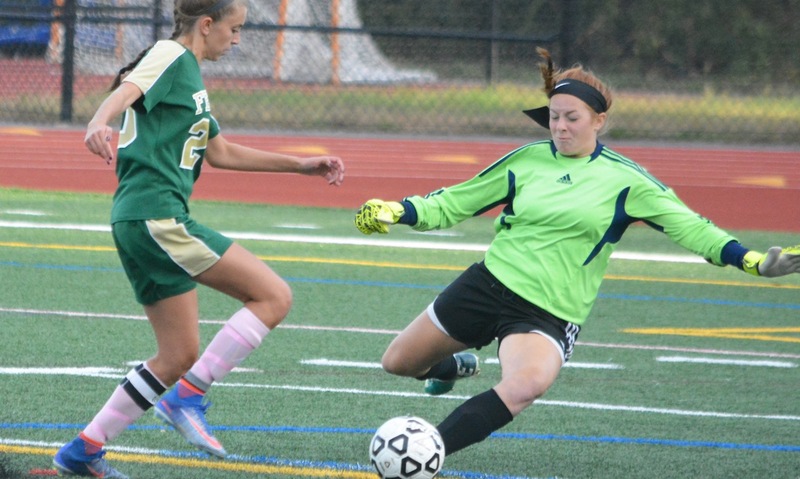 KP goalie Emma Durant was tested soon after when Cassidy McMahon flicked a pass to Amanda Mangano, whose shot was partially blocked and saved at the near post. In the 27th minute, Layne took a throw-in just inside the left side of the box and she found a sliver of space to squeeze the ball to Snead, who took a left-footed shot that looked destined for the far corner until Whitman flew across to make a two-handed save. Just seconds later and Bryn Anderson had a go from 20 yards for the Hornets but Durant was able to get a fingertip to the ball and knock it over the bar. In the 30th minute, Layne showed off the skills that have made her one of the league’s top scorers when she used three touches to separate herself from three Mansfield defenders on the edge of the 18 and lined up a right-footed shot only to have it ricochet off the post. Six minutes before the break, KP hit the post again. A corner landed in the middle of the box and the ball popped off the foot of Abby Baker but again stayed out thanks to the woodwork. KP had its chances in the second half as well, although the Warriors were limited by playing into the gusting wind. Layne had an early chance after a slip by the Mansfield defense but put it wide and Makayla Griffin saw her opportunity from a Snead flicked header fly wide just a minute later. Despite all the chances that both teams were managing to create, the defensive efforts were superb from both teams. The Mansfield back four of Kerina Geminiani, Emily Vigeant, Taylor Smith, and Mikaela Maughn were stretched by the dynamic KP attack, but held firm with help from midfielders Melissa Reef and Anderson. The Warriors back line, marshaled by Emma Corcoran and Olivia Berry in the middle with Hanna Balunos and Lauren Anderson on the outside, also put in a strong shift against a varied Mansfield attack. Pichel credited a change in formation for putting the pressure on the Hornets higher up the pitch, particularly Faye Veilleux creating havoc in the center of the field. Both teams had chances to win the game in the final 20 minutes. Snead had a header off a corner blocked on its way to goal and then Smith belted a perfect 45-yard free kick that smashed off the crossbar and was cleared. Stephanie Kemp had the ball fall to her off a corner only for Lauren Anderson to get a piece of the goal-bound shot and keep it out. In the closing seconds, Kemp would have one more chance as she tried to get on the end of the long through ball but Durant got the angle and timing perfect to smother the ball at Kemp’s feet. Seconds later, the whistle put an end to a breathless top of the table clash. King Philip (15-1-2, 12-1-2) will have the chance to win its first title since 2002 when it hosts Franklin on Friday afternoon. Mansfield (12-1-2, 12-1-2) can seal the program’s first back-to-back titles with a win at home against Oliver Ames on Thursday night. WRENTHAM, Mass. 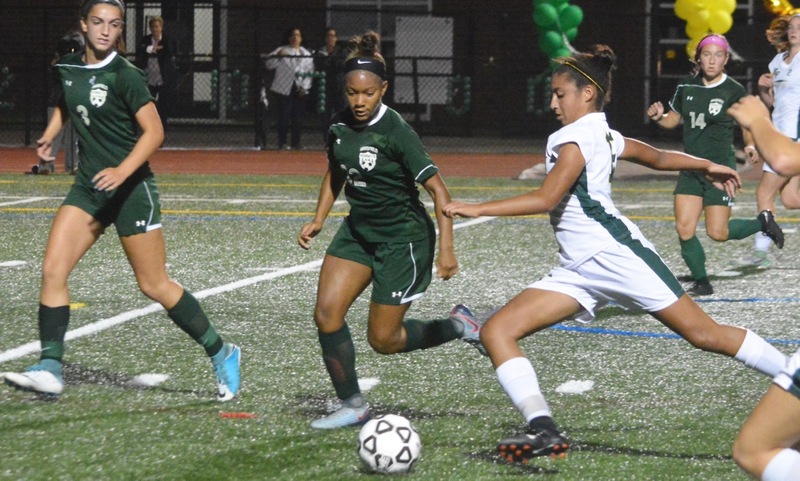 – Makayla Griffin tried to play a ball forward in the attacking third with only seconds to play in Saturday afternoon’s match-up with Bishop Feehan at Macktaz Field. The ball took an unfortunate bounce off the heel of Rachel Hogan as she made a run into space and caromed to a Feehan player. The King Philip defense tried to race back into position, but the Shamrocks countered with pace and created a chance for leading scorer Enisa Amedio. The forward sped into the box and fired a low shot only to be denied by KP goalie Emma Durant, who slid out to block the shot with her legs. That save preserved a 2-2 draw for the Warriors in game that they controlled for large portions against a Feehan team that is considered among the top 10 in the state. KP avenged a 1-0 loss to Feehan in the first meeting and moved one point closer to qualifying for the state tournament. The Shamrocks got off to the perfect start, scoring inside the first two minutes of the game. Bailey Conti kneed in a corner from Olivia Bishop to give Feehan the very early lead. KP answered right back with a set piece of its own. Junior defender Emma Corcoran played an angled free kick from 35 yards on the left side that eluded everyone in the box except for freshman Avery Snead, who prodded the ball into the net at the back post to tie the game. In the 18th minute, Corcoran passed on a chance to put a free kick into the box and squared the ball to Sarah Fleck on her right. Fleck took a dipping shot from almost 40 yards that the Feehan keeper stood no chance of reaching but that smacked off the crossbar. Just seconds later, the visitors earned a corner and Katie McCarthy nodded Feehan in front. Other than the two corners, KP was pressing the play and putting the Shamrocks on their heels. The combination of Fleck and Griffin was opening up the Feehan midfield and Snead and classmate Chloe Layne had the Shamrocks defense twisting and turning. 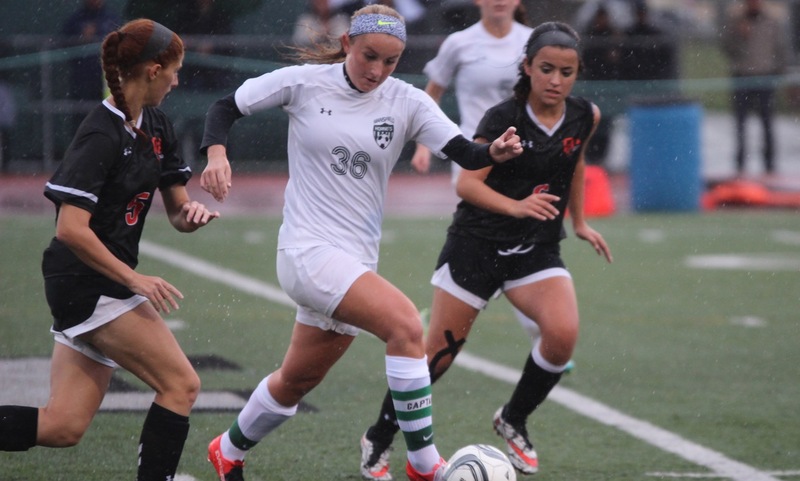 Layne nearly tied the game just three minutes after Feehan took the lead with a series of feints and step-overs that split the right back and central defender. The chance was smothered by the Feehan goalie but was just a preview of the issues that Layne would cause running the left channel. Feehan almost doubled the lead in the 33rd minute but Durant was quickly off her line and threw out a quick left hand to deny Shealyn Quinn. Seven minutes later, with halftime looming, Layne pulled KP level. Griffin sent in a cross from the left that Layne settled with one touch and created space just inside the box before depositing a shot under the bar to make it 2-2. Just four minutes into the second half, Feehan had a rare opportunity from open play when a through ball split the defenders and gave Amedio a chance to run at the keeper, but Durant came flying out and got a hand to the ball to stop the chance. In the 50th minute, Corcoran lined up a 25-yard free kick and for the second time in the game, a KP player fired a shot off the bar. Durant (five saves) came up huge off another Feehan corner 15 minutes later to not only stop the initial header but also to stuff the follow up from point-blank range. That aggressiveness paid off in the final minute of the game, as Durant came out quickly and blocked an Amedio shot with her legs that kept it at 2-2. “That was a nail-biter right there,” said Pichel of the heart-in-mouth moment that the Warriors had at the end. “I thought, ‘oh no, after all this work.’ [Emma] came up huge. Durant had plenty of help in front of her, including Corcoran and freshman Olivia Berry. The central defensive pairing was effective in compressing the space for the forwards and covering for each other when one decided to step forward, either to prevent an attack or to start one. At the final whistle, KP felt a mixture of relief and disappointment because snagging a point from Feehan is a positive but the overall play had the Warriors believing that they were the team on top. That gives the Warriors confidence as they get back into league play this week. King Philip (8-3, 9-5-1) will try to get the one point left to ensure a return to the state tournament against Attleboro on Monday.